Treasure Hunt : What will you win? Home frugal living Treasure Hunt : What will you win? Welcome to the Treasure Hunt! 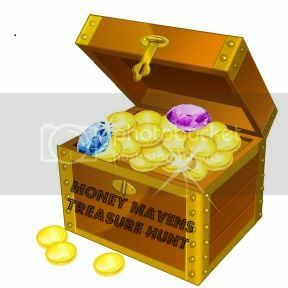 This hunt is brought to you by the Money Mavens, an elite group of bloggers working to save you money! Each week we will present a treasure hunt where you can win big! What is the Prize: Just like a real treasure hunt you do not know what you will win. Each week it will be different. It will be something that will save you money! How to enter: To enter to win you will visit each blog listed below and answer the question for each blog. You will type your answer in the “extra info” space. You do not have to do all entries BUT each entry means another chance to WIN! Date & Time: The winner will be announced at the close of the treasure hunt. The treasure hunt will be open from 7/12/11 9pm CST – 7/13/11 9pm CST. Where: This hunt will be on all the blogs participating. You do not have to enter at all blogs. If you enter on one you will be entered on all. Ready to hunt? Let’s Go! $5 for a Photo Flipbook! Shipping & uploads included!